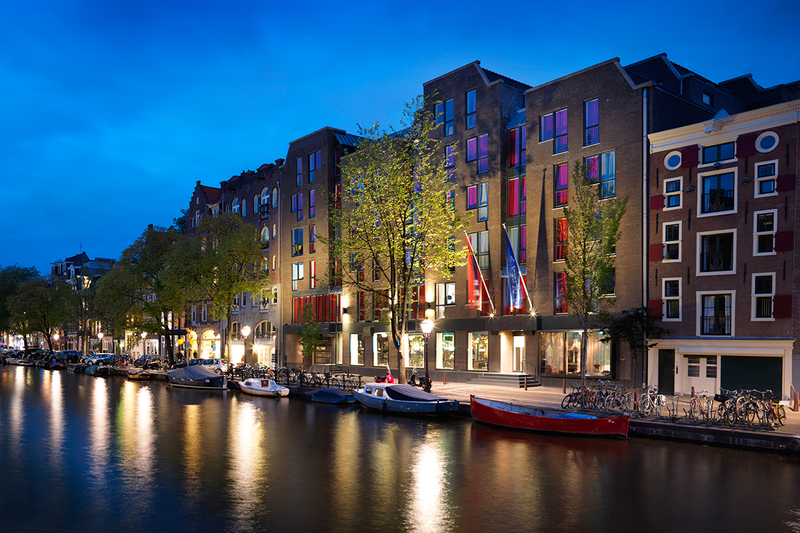 On the 29 of October 2012, Andaz Amsterdam Prinsengracht opened its doors as the first Hyatt hotel in the Netherlands and the ninth addition to the Andaz brand. 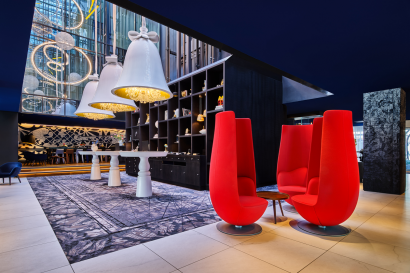 Represented in world-class cities such as London, New York and Shanghai, Andaz is making its mark in the cultural heart of vibrant Amsterdam, signifying the first step in the expansion of the brand into continental Europe. Future Andaz properties soon to be opened: Dubai, Palm Springs, Tapei, Sanya Sunny Bay, Shenzhen Bay, Turks & Caicos and Gangnam Seoul. Andaz Amsterdam Prinsengracht beats with the same heart and energy as its locale, the creative city of Amsterdam. Here renowned Dutch designer, Marcel Wanders, took the once unremarkable, former public library, and embarked on a mission to unleash the rich and fantastical history of the Netherlands through design. The design ties together old and new, raw and beautiful and polarities in a magical way. 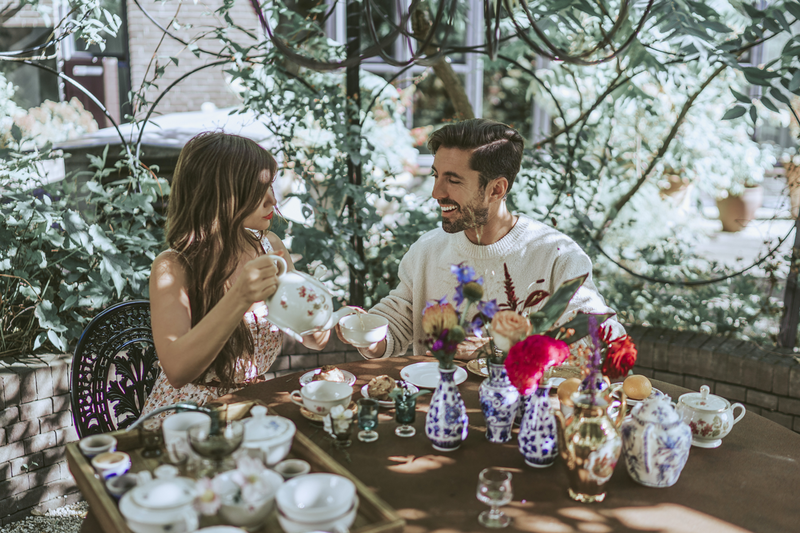 There are no barriers, only opportunities to connect with the like-minded and explore the sights, sounds and tastes of our home, the historic center of Amsterdam’s eclectic Jordaan district and canal ring, known for its forward fashion, quaint boutiques, acclaimed art and vibrant cafes. 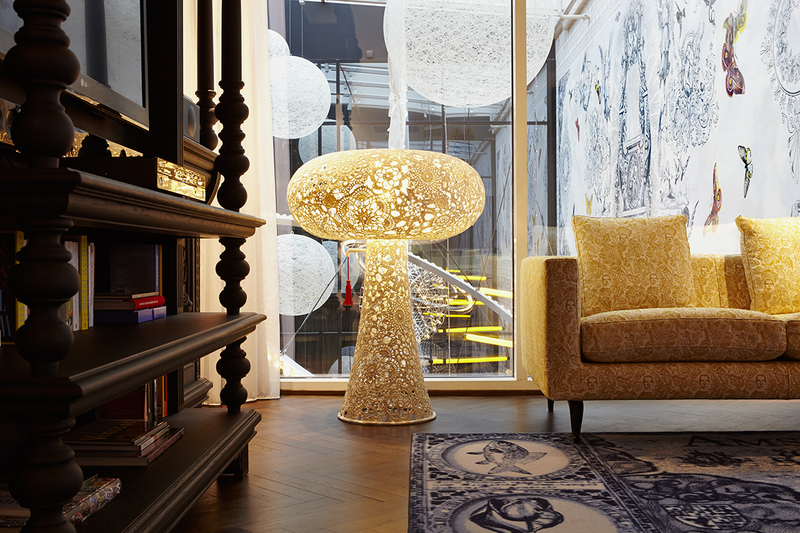 Once a plain public library overlooking the Prinsengracht (Prince’s Canal), Andaz Amsterdam has been entirely transformed by Dutch architect and renowned designer Marcel Wanders, reflecting a modern and adventurous view of Dutch history and local culture. – Surrounded by the iconic canal ring which was added to the UNESCO World Heritage List in 2010 and situated in the historical and vibrant heart of Amsterdam. Everything you need just steps away for the ultimate local Amsterdam experience. 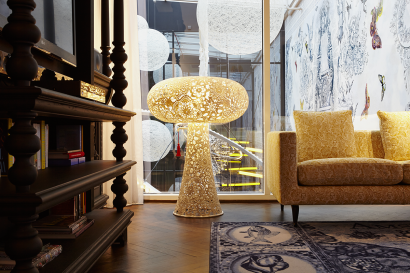 – Entire hotel interior designed by world-renowned Dutch designer Marcel Wanders with inspiration taken from the Dutch golden age, the buildings former use as the Public Library and the Alice in Wonderland fairytale. – A vibrant hotel experience is one that immerses you in the local culture. 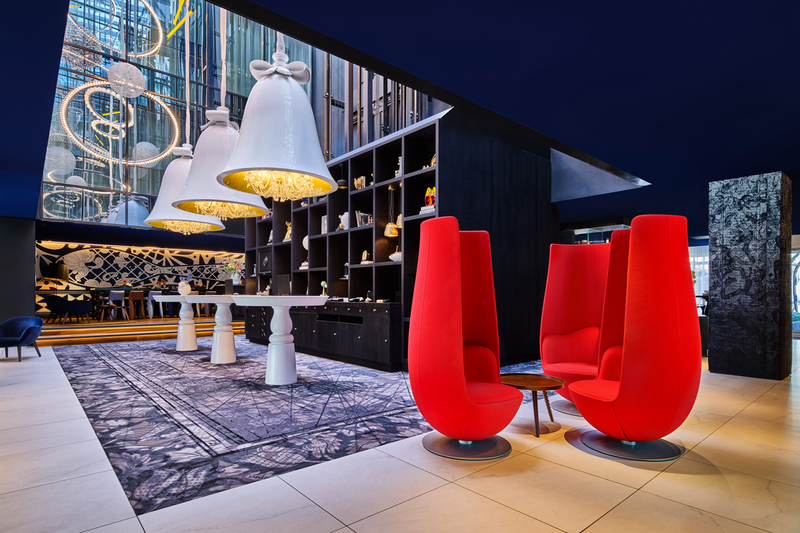 Andaz Amsterdam promises unique local experiences and local perks that you cannot get from staying anywhere else. – The Andaz inclusions, such as complimentary snacks and non-alcoholic drinks from the minibar, local phone calls, wifi and impromptu drinks in the lounge including a cup of coffee or tea throughout the day and an evening wine hour. – Inspiring Views, look out onto the charming Prinsengracht canal, the hotel’s enchanted garden or the observatorium themed atrium. – Bluespoon Restaurant & Bar with its quirky Marcel Wanders interior, award-winning Alice in Wonderland inspired craft cocktails and innovative local menu which brings dishes to life with a Dutch twist makes a popular canal side hotspot for guests and locals. – An environment without barriers, offering friendly and accommodating spaces that invite our guests to move seamlessly from one unique experience to the next, with personal connections and friendly interactions in each. Although recently opened in 2012, Andaz Amsterdam Prinsengracht is already full of history with its unique location on the Prinsengracht, the site of the city’s former Public Library. The Prinsengracht is part of the iconic canal ring that was added to the UNESCO World Heritage List in 2010. This puts our hotel right in the bustling heart of the city. Surrounded by the creative scene and dynamic spirit of the Jordaan district and to the right steps away from the quaint Nine Streets, the hotel’s charming neighborhood is filled with Amsterdam’s main art galleries, unique specialty shops, trendy fashion boutiques, and stylish restaurants. To the left, a short stroll gets you to Amsterdam’s iconic Museumplein, home to key museums such as Rijks, Stedelijk, Moco & Van Gogh museum. It is no secret that Amsterdam is home to pockets of cultural neighbourhoods with different experiences to offer. It is also no secret that our boutique hotel is perfectly located in the middle of all of the fun, as we are adjacent to the quirky and historic “Negen Straatjes” (Nine Streets) neighbourhood bursting with quaint boutiques and cafes, and only steps away from entertainment happening in the city centre and Museumplein, making it an ideal starting point for your unique Amsterdam experience. 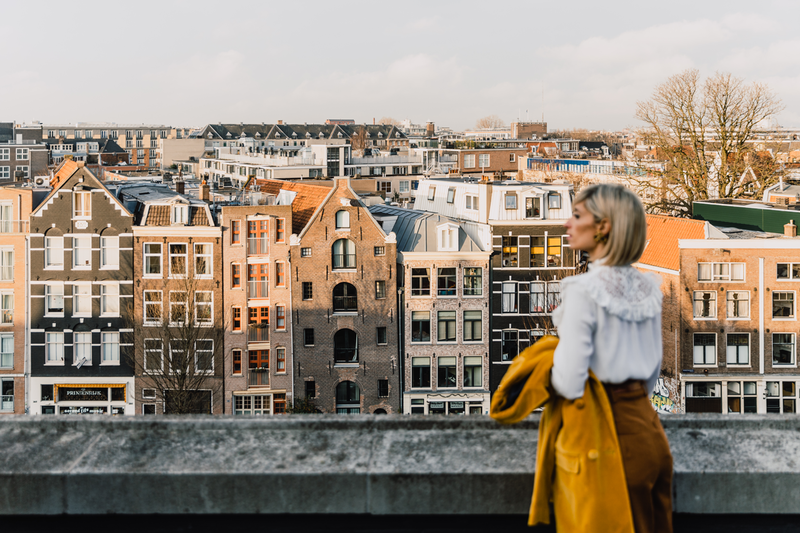 See various sites and immerse yourself in Amsterdam’s rich history by taking time to visit the Anne Frank House, Westerkerk, Royal Palace, and the Red Light District. You could also visit some of the city’s most famous museums located a short stroll from the hotel, such as the Stedelijk Museum, Rijksmuseum, Moco Museum or Van Gogh Museum. 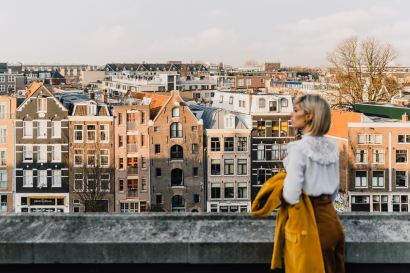 Our Andaz hosts have all the knowledge of the local area to make our boutique hotel the perfect home base for your explorations in Amsterdam. • The hotel building is the former Public Library of Amsterdam. The library was there from 1977 until 2007 when it was relocated to Oosterdokseiland. This heritage informs the design direction with books, both physical and deconstructed, forming the look and feel and illustrations that form murals around the hotel, taken by Marcel Wanders from books in the original library. Another design theme of the hotel is that of the Alice in Wonderland story, again a subtle reference to the building’s former use. • First hotel in the world that solely focuses on video art and showcases a permanent collection of 50 unique works throughout the hotel, the largest private video art collection in Europe. • The hotel consists of two building in between two canals: the Prinsengracht (Prince’s canal) and the Keizersgracht (Emperor’s canal) which are connected by a charming silent garden with large Alice in Amsterdam mural. • All guestrooms feature fabulous views whether overlooking the iconic canal, the hotel’s enchanted garden or the observatorium themed atrium. • In the Spring/Summer, every Wednesday joins the 7.30am 5K run or two Sundays a month join the complimentary bike tour to find out some hidden secrets of this beautiful city. • Andaz Amsterdam Prinsengracht’s Penthouse Prinsengracht Suite boasts the largest hotel terrace in Amsterdam overlooking the canals. The perfect place for a city sundowner. • With the addition of its very own vintage salon boat in 2018, the hotel now offers weekly tours with drinks and bites taking guests on a special Andaz tour of the city, the best way to discover Amsterdam. 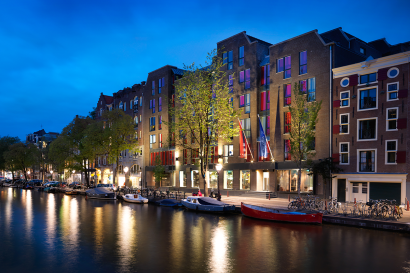 • Andaz Amsterdam Prinsengracht holds the Green Globe Certification, the premier global certification for sustainability. • Andaz Amsterdam Prinsengracht was awarded the Forbes Travel Guide Recommended Award 2019, Top 5 hotels in Amsterdam in Conde Nast Traveller Reader’s Choice Awards 2018, and Top 25 luxury hotels & hotels for service from Tripadvisor 2018-19. • At Andaz Amsterdam Prinsengracht we give dogs a warm welcome. Rest assured that your furry friend will enjoy a comfortable and relaxing stay with our special Very Important Dog programme. Treat your family to an authentic, local experience that makes them feel inspired, encouraged, and connected. With discounts on a second room for children 12 years and under there is plenty of room for everyone. On top, we will spoil the young guests with a special check-in, non-alcoholic mini bar and little gift. For the little ones under the age of three, enjoy the benefits of our “Very Important Baby” (V.I.B.) programme. We will make sure to welcome your baby with all necessities to make its stay comfortable, from a baby bath, baby crib and special baby care products to some fun toys and special cutlery. When reservations are made in advance, we also offer a babysitting service. • Experience comfort and sophistication in one of the hotel’s 122 stylish designed rooms, including 5 suites. 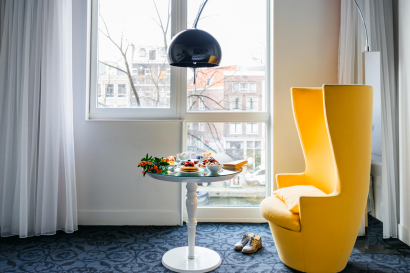 • With rooms ranging from 24 sqm (258 sq ft) to 36 sqm (387 sq ft) and suites measuring from 55 sqm (592 sq ft) to 141 sqm (1,517 sq ft), the hotel is home to some of the largest guestrooms in compact Amsterdam. • Featuring an artistically Dutch décor with small custom details to bring Dutch history to life with typical dry Dutch wit. • The hotel has three signature suites: the Andaz Suite, Andaz Large Suite and the one-of-a-kind 141-sqm Prinsengracht Suite, boasting a 35-sqm roof terrace, the largest hotel terrace in Amsterdam overlooking the canals. • Rooms feature an open-plan room concept that provides you with all the comforts of home, such as complimentary snacks and non-alcoholic drinks from the mini-bar, local phone calls and Wi-Fi, as well as, plush robes and slippers, and upscale local bath products. Or enjoy the Geneva sound system with iPod™ dock and a 42-inch TV featuring international cable. 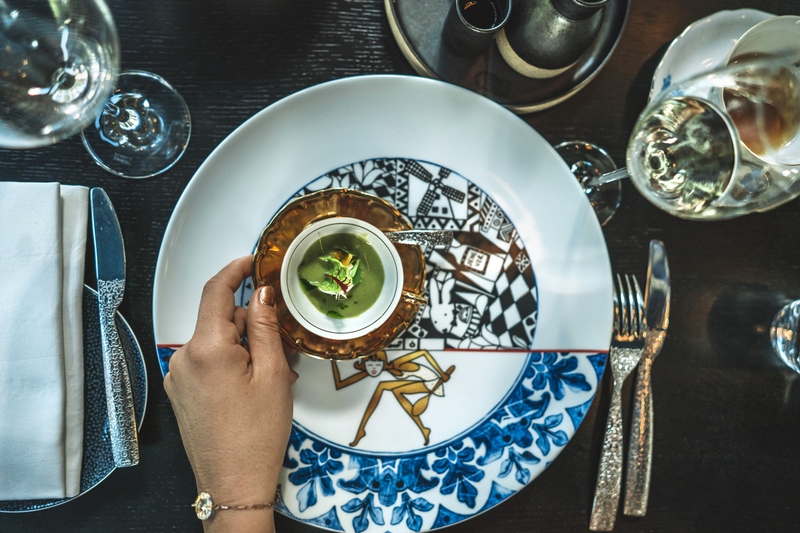 In a quirky Marcel Wanders-designed environment on the canals, Bluespoon Restaurant takes the stiffness out of traditional fine dining, adding a light playful touch to a special dining experience in which every plate is a fresh and colourful work of art. The menu presents creative European dishes celebrating the best of Dutch ingredients with a unique modern twist. Led by Executive Chef Sander Bierenbroodspot, the Bluespoon team, a team from around the world but firmly rooted in Dutch soil, hope to delight, be it with an interesting story, a forgotten classic, a unique cocktail pairing, or an ingredient you might never have tried. 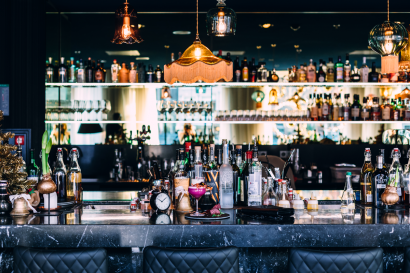 At the award-winning Bluespoon Bar, led by Bar Manager Martin Eisma, the team craft Alice in Wonderland inspired cocktails and champion green bartending initiatives in the city through innovative local partnerships and monthly events. 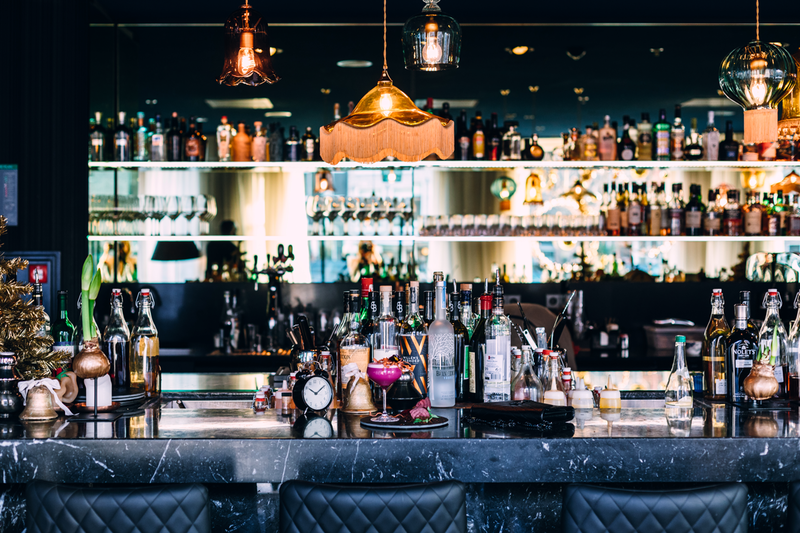 Choose to sink into a cozy dark corner and watch the world go by on the canal outside, or sit up at the open bar counter to watch the team craft some magic. – A visit to the artsy Andaz Spa will be your perfect city retreat. – A place to just be and be well, with an exclusive partnership with British heritage brand Elemis, the Spa treatment menu specializes in massages & facials that promise to revive, restore & rejuvenate. Our favourite the Superfood Facial. 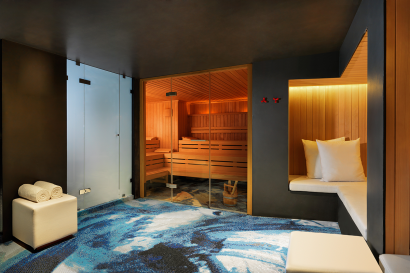 – Finish your wellness experience with complimentary use of the fully equipped gym, sauna, rain showers, relaxation area and luxurious amenities. – Pursue an active lifestyle during your stay in Amsterdam. 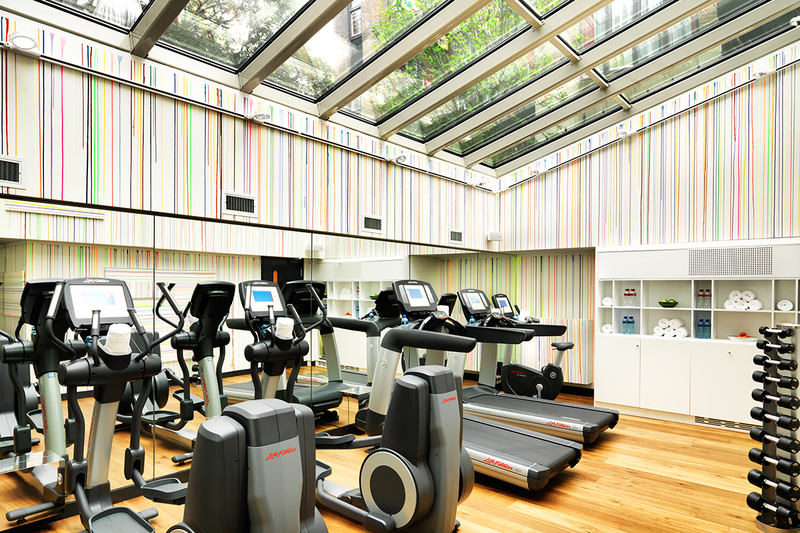 From state-of-the-art cardio to free weights, you will be able to enjoy a total body workout to energise and recharge your spirit. – Inspiring artistic design with natural daylight pouring in from the glass ceiling looking up into the hotel’s enchanted garden. 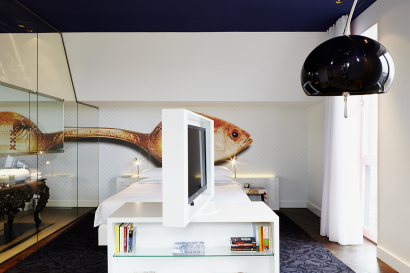 • Andaz Amsterdam Prinsengracht offers the Andaz Studios. A variety of 6 distinct venues, totally 575 square metres of flexible space, and suite for corporate, social events and wedding celebrations. • Breathing a home-like ambience, the Studios provide the iconic and artistic Marcel Wander’s signature style, comfort and state-of-the-art technology for inspired and productive gatherings. • Complimentary wireless Internet, a built-in coffee maker, refrigerator and storage spaces are facilitated in each room. • Andaz Run: Join team for a weekly Wednesday morning run of approximately 5 kilometers • Video Art: Experience the vibrancy of Amsterdam by exploring our unique, dynamic video art collection, comprising 50 unique works, ranging from young talents and established names to a few carefully selected international masters, such as Ryan Gander, Erwin Olaf and Mark Titchner. The hotel boasts the largest video art collection in Europe. • Bike like a Local: Biking through Amsterdam is the best way to enjoy and explore what the city has to offer. Our special Andaz bikes will have you roaming the canals like a true local. Why not join the group bike tour before brunch two Sundays a month in the summer. • Boating: Looking out onto the Prinsengracht or ‘Prince’s canal’, our hotel is the perfect starting point from which to begin your boating adventure. 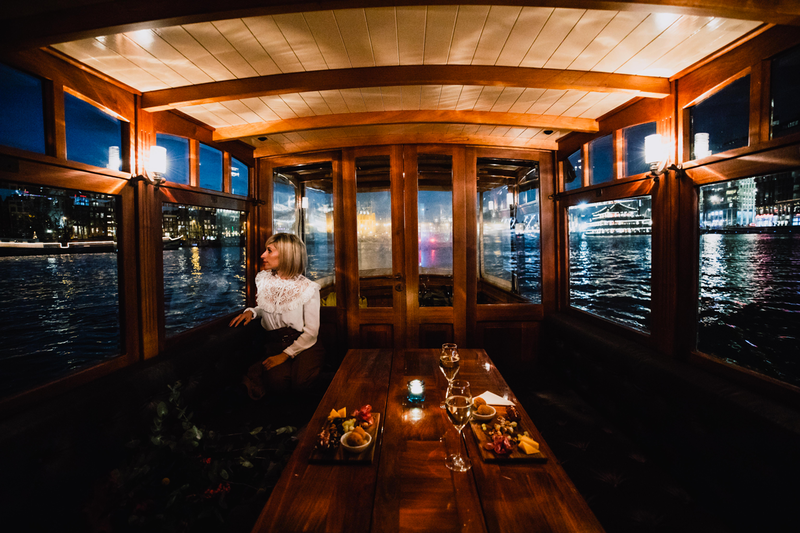 What’s more, we have our very own vintage Andaz salon boat that departs every Friday and Saturday for a unique route, the best and most luxurious way to discover Amsterdam from the water.